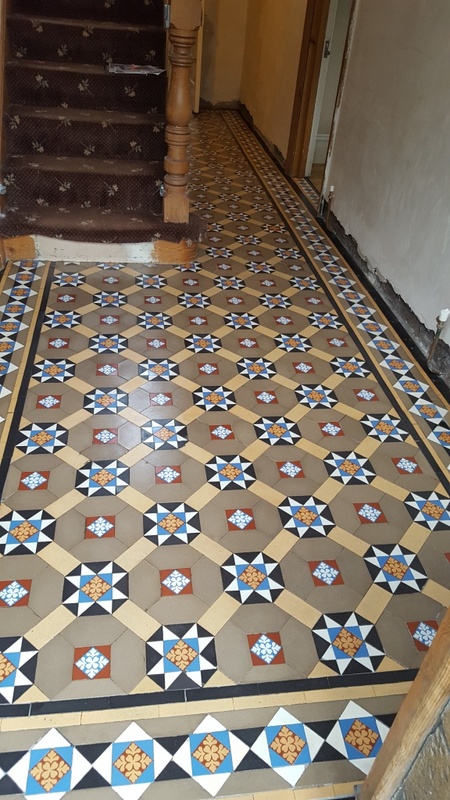 This Victorian tiled hallway floor at a house in Penarth needed a deep clean and seal but also there was the added complication of what to do with the under stairs area as you will see in the photographs below. 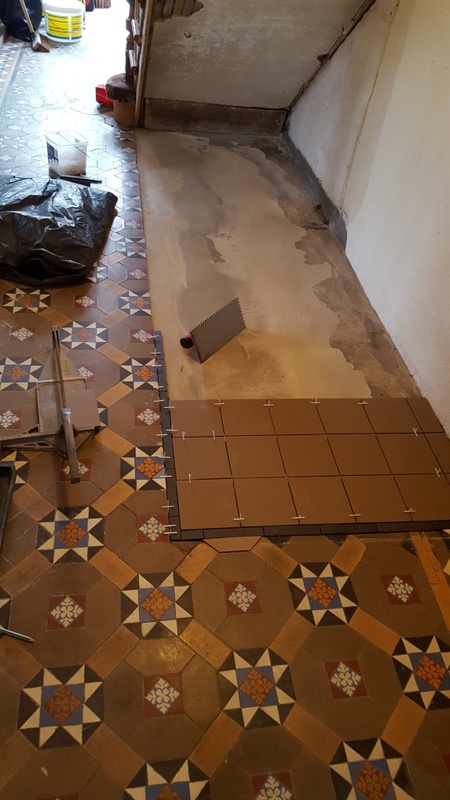 There were many options to consider and after many visits to the property to discuss various options we finally decided on adding new replacement tiles that complimented the main colour in the floor. 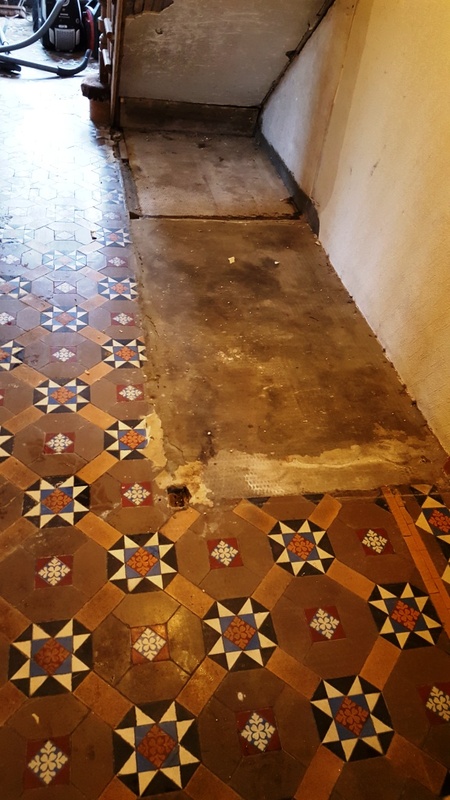 This floor was in quite a bad state covered in paint splashes and cement after new damp proofing also under the staircase there were no tiles just cement which the customer hoped could be tiled. I assured the customer that they made the right choice by contacting Tile Doctor that they would be very happy with the outcome of their project. 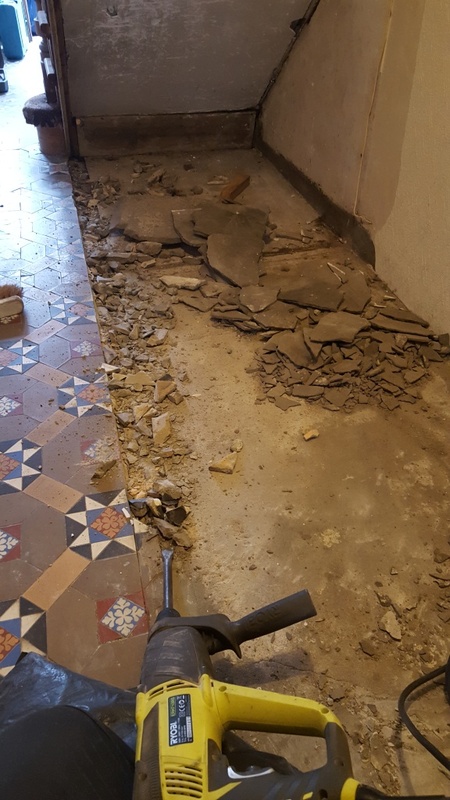 Using a Kango hammer I first removed all the cement from area under the stairs that was to be retiled to get the main mess out of way then scraped off as much cement and paint off the tiled surface as possible. Once this was done and the area clear I was able to re-cement the area to be tilled to the right level and once dry tile the area with tiles in the chosen colour from a company known as Original Style which produce good tile replicas. The floor was checked for moisture which proved dry and then cleaned with a mixture of Tile Doctor products including NanoTech HBU Remover (HBU stands for Heavy Build-up), Remove and Go to tackle the paint splashes and to ensure any sealers were removed and Pro-Clean which is another powerful cleaning product. All these products are safe to use on tiles floors and were worked into the tile and grout using a scrubbing pad fitted to a rotary machine. Once the floor was clean the soiled cleaning solution was extracted from the floor using a wet vacuum and the floor then thoroughly rinsed down with water, again extracted using a wet vacuum. Problem areas were re-treated by hand and scraped using wire wool and Tile Doctor Grout Clean-up which is an acid product designed to remove cement stains and grout smears. The floor was then rinsed again to remove any product traces, dried as much as possible with the wet vacuum and left to dry off overnight. I came back the next day to seal the floor, checking the tiles for moisture first using a damp meter. To seal the tiles, I used Tile Doctor Seal and Go which adds that protective layer and a nice sheen to the floor. 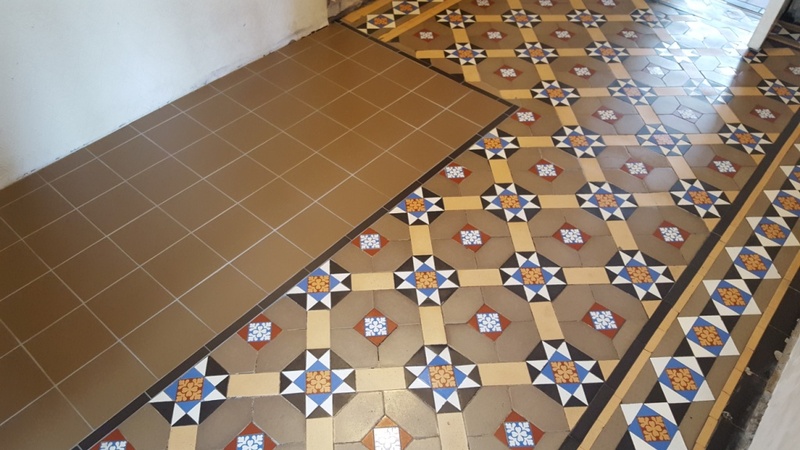 The replacement tiles blended in well with the original Victorian floor tiles which now following the deep clean and re-seal looks like a new installation. 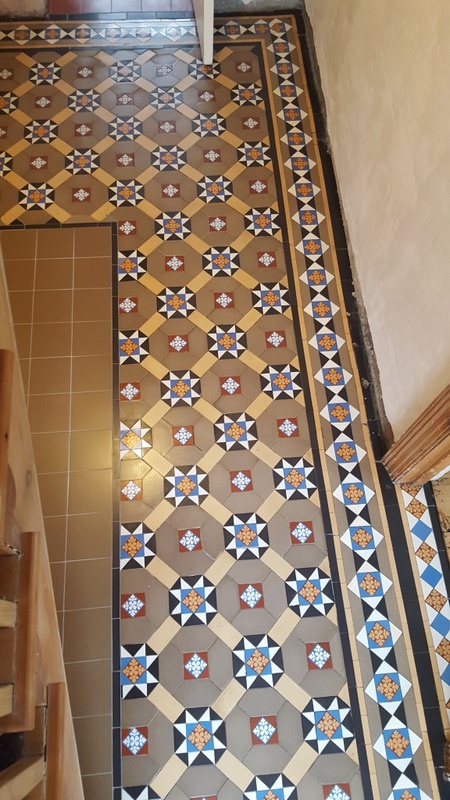 This entry was posted in Victorian Posts and tagged hallway, Penarth, South East Wales, tile cleaning, tile sealing, victorian tiles by AbzDominise. Bookmark the permalink.